There has been a resurgence in Hi-Fi over the last several years. While CD sales have slumped, vinyl record sales are on the rise. Jack White’s Third Man Records is releasing albums only on vinyl and digital download. Even Best Buy has made room in stores for vinyl. This last month, GQ magazine had a multi-page spread on Hi-Fi. The equipment in the article (like the clothes on every other page) are priced a little bit higher than the average Joe can afford, so I thought I’d put together a similar system at an affordable price (though not at the same level of performance). First things first: high quality stereo speakers. Forget surround sound for a minute; when looking for a great Hi-Fi system you want to focus on stereo audio. GQ selected a pair of Bowers & Wilkins CM1 speakers at $1000 for the pair. I’m surprised considering the expense they put into the other gear, though they did get the “speakers first” part right. The speakers are the most critical part of a Hi-Fi system. There is a general axiom when it comes to speakers: the bigger the better. This isn’t always the case, but is a good general rule. However, we don’t all have the space for tower speakers at home, so I will take GQ’s lead and offer some more affordable bookshelf speakers. 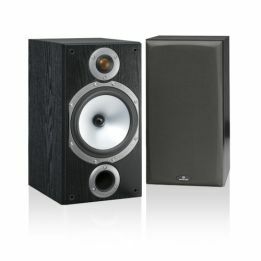 Monitor Audio is another respected British speaker firm, and you can’t argue with their prices. Often compared to speakers twice the price, the BR2 bookshelf speaker retails for $450 a pair. Featuring a 6 1/2 inch Metal Matrix Polymer woofer, and a 1 inch Ceramic Coated Aluminum Magnesium dome tweeter, this two-way speaker out matches most speakers in the same price range. The Bronze BR series speakers from Monitor Audio feature the same drivers as their higher-priced speakers, but with a cheaper cabinet. So they might not look as nice, but their performance is similar. Still a little rich for your blood? Try the Axiom M3 v2 available direct at $330 a pair. Great speakers demands great amplification. Cheaper amplifiers can cause distortion in the speakers that (though not always audible) can damage the speakers. GQ offered a Cayin A-50T tube amplifier at $1,400 retail. This is actually a bargain when it comes to amplifiers. I’m hard pressed to find a comparable product for less. Our friends in the British Isles comes to our rescue again with Cambridge Audio. The 650A amplifier provides 75W per channel, and retails for $699. 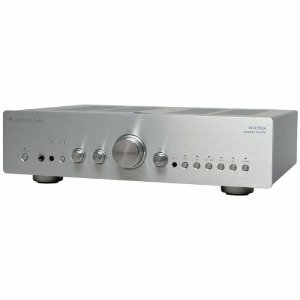 This award winning stereo amplifier is another product that offers astounding performance at a low price. For those Axiom speakers, try the Cambridge Audio 550A at $549. The above amplifiers all have integrated preamps, so you can use them as is with the sources plugged directly into them. GQ got this one right on the money. The $1,200 Peachtree Audio Nova is an integrated preamp/amplifier with a DAC for connection via USB to a PC, AppleTV, Squeezebox, Apple Airport, Sonos, or other digital audio source. Of course if you’re looking for a lower-priced alternative, the Peachtree Decco 2 can be had for $799 offering much of the same features. The gateway to analog audio is the LP turntable. The offering from GQ is the VPI Scout at $1800, which is a great turntable at a great price. They also offered a budget turntable at $380, the great-looking Pro-Ject Debut III. Just keep in mind the tone arm and cartridge can also run you a few hundred dollars, so these turntable prices are not the final amount. While not nearly as stylish as the other two, the Denon DP-200USB retails for $250. This turntable also encodes MP3s, so you can take that rare black-blue vinyl and put it on your iPod easily. You’ll be the hippest cat on a fixie this side of Williamsburg. I do still listen to CDs. They just sound better than the compressed audio files. GQ thinks so too, “it’s like the difference between watching Avatar in IMAX 3D and streaming it over YouTube on a laptop.” That’s why they offered the $2,500 April Music Aura Note Premiere. You can forgive that price considering it is essentially a CD player/DAC/premp/amplifier all built into one, but that’s still expensive. For the realists out there, I’m just going to suggest the Oppo BDP-83 Blu-ray Disc player. One of the best Blu-ray players on the market, equaling product four times its price, and is also one of the best CD players, SACD players, and DVD-Audio/Video players around as well. All of this for $499. If you’re looking for something a little lower in price, the Sony Playstation 3 is also a great CD, SACD, DVD, and BD player. And it’s $299 price point is unbeatable. Don’t have so much to spend? Invest in a good pair of powered speakers, like the Audioengine A2. These only cost $199, sound great, and can you can plug your sources into it directly (one at a time). I hope this article helps spur your motors to piece together your very own Hi-Fi system at home. Please, sit down and enjoy an album from beginning to end. I’d suggest the debut album from Jonsi. Thx verry much. I am driving the 2011 Dodge Challenger and wanted to put some hifi in it. This is, what i need so far! Thx for the infos!